I'm always a bit irked when I sit down -knuckles cracked, coffee poured- to write a review on some marvelous book I discovered only to find I'm late to the game and it's already been made into a major motion picture. At least this one hasn't been released yet, but still. Humph. 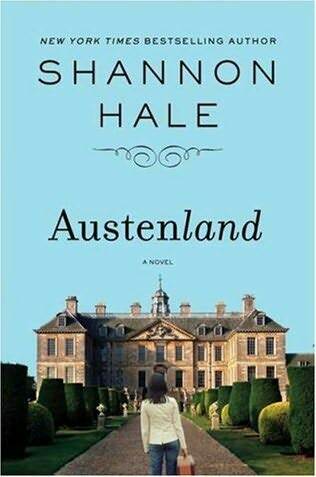 Austenland is the story of a young woman (33, which is younger than me, and therefore qualified as young) who, like many of us, is a HUGE Jane Austen fan dreaming of one day meeting her Mr. Darcy. This idea of perfect romance has become so entrenched in her that she can no longer even attempt a relationship with an actual man. An elderly relative understands this about her, and leaves her a vacation to Austenland in her will. Austenland is a (presumably) fictional place where we pathetic Regency wannabes of means can do what we've always fantasized and immerse ourselves in Austen's world for whatever duration that can be afforded. Visitors are issued a Regency wardrobe complete with corset and bloomers, and are tended by a maid to dress them and arrange their hair. Their electronics are confiscated and replaced with embroidery hoops, and a new identity is created for them so they can fully immerse themselves in a world of pretend, populated by actors paid to be equivalent Darcys and Bingleys and Wickhams to palpitate the guests' desperate hearts. Jane Hayes doesn't want to go, but decides it may be her last chance to get Mr. Darcy out of her system so that she may finally function in the real world as a fully operational adult. She goes through phases of resistance and withdrawal, finally resolving to truly act the part and make the most of the ridiculous scenario she finds herself in. Along the way she must mingle with middle-aged women pretending to be twenty, a handsy "uncle," a trio of top-hatted suitors, and a gardener who appears to be just as bewildered by the whole thing as she is. By the end, the question is no longer whether she can shake Mr. Darcy, but who and what around her is real. This is the most perfect bit of Jane Austen fan fiction I've come across. The reader is no longer separated from Austen's imagination by overzealous writers flinging semi-colons and pretentious words around like Jackson Pollock. Jane Hayes is the literary incarnation of the reader, and Hale writes with a true sense of herself and the fact that she is not Jane Austen but nonetheless a very talented writer who would never say "nonetheless." Hale's wit rivals Austen's own, but in a 21st century sense. Looking over the cast for the film on imdb, I think they've done a halfway job of rounding out my imaginings. Felicity -oops, I mean Keri Russell- is Jane Hayes and Jennifer Coolidge is the ridiculous Miss Charming, those two are perfect. But their choice for Mrs. Wattlesbrook, who I saw as a rotund jowly creature is Jane Seymour? And Mr. Nobley, the Mr. Darcy character, is someone I've never heard of with ears that look like they could pick up signals for SETI. Humph again. Well, maybe he's better in motion.